The pacifier holder clips feature a Playtex copyright logo that slides up and down to adjust the clip, as well as a ribbon and clear plastic ring that stretches to fit the pacifier. The clips were sold in green with a monkey figure, pink with a flower, and blue with a truck, and were sold at online and Walmart and Target, as well as other major retailers and baby stores from July 2010 through October 2013. This isn’t the first pacifier recall that we have told you about, and not even the first one for a choking hazard. Sassy previously recalled 37,000 pacifier/rattles for essentially the same choking concern. The bigger concern here is that the Sassy product was recalled after one report of incident. Why did it take 99 broken clips before the Playtex clip was pulled off the market. 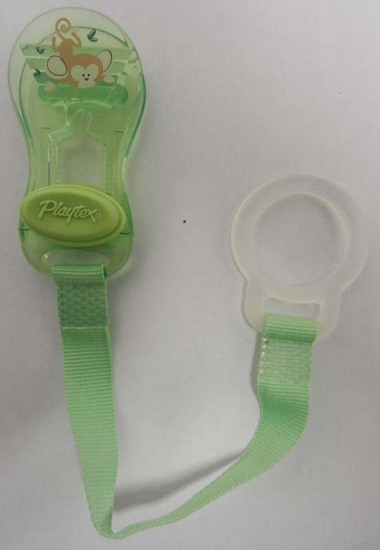 Scary thing is I had one of these Playtex clips for my daughter, but thankfully with no problems. It’s frightening to think that one manufacturer can’t learn from the mistakes of others. When it concerns our children, shouldn’t we demand the highest of product testing? I know that is a trite thing to say. You can never go wrong demanding protection for our children or our troops abroad. But here the tired and trite rings 100% true. It is a pacifier. This is not complex. We are not splitting atoms here. Just make the thing safe. I know we are a country of 311 million people or whatever. But even one needless death of a child is too much to bear. I have always maintained that the legal system and, more specifically, tort lawyers, help keep us all safe. But these case are more problematic. How many deaths will come of these products when they are defective? Even the negligently designed pacifiers are going to keep kids safe the vast, vast majority of the time. So if two kids die and you pay those claims, the numbers still work when you are making millions of pacifiers that cost you 10 cents to make that you are selling for $12. The tort system does not do much to encourage these thing to be particularly safe. These companies always – probably sincerely – think the best things will happen. That fear they had, oh it is a one in a million shot. But when you are making million of a thing, like the product in this recall, the one in a million thing is going to happen too many times.